eBay is the perfect place to learn the ropes of what it's like running an online business. It provides the tools, technology, and platform a would-be entrepreneur needs to launch their first successful small business. It takes some know-how, however, to get that business off the ground and grow it into a success. 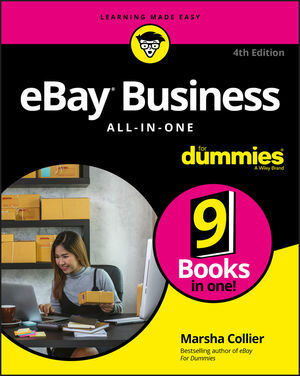 In eBay Business All-in-One For Dummies, Marsha Collier shares the expertise she gained as one of eBay's first Power Sellers on how to get ahead, stay ahead, and expand your business onto other platforms when it's time to grow. eBay continues to grow as it connects new individuals with items to sell with would-be buyers every day. Combining essential information covering seven key topics, this all-encompassing guide shows fledgling entrepreneurs how to sell like a pro, present and market your items, become a power seller, deal with office and legal issues, and so much more. If you have an eye on building a business on eBay—and beyond—this is the one-stop guide you need to succeed. Marsha Collier is a recognized expert on ecommerce, online customer service, social selling, social media marketing, and eBay. Over one million copies of her various eBay titles have sold since her first, eBay For Dummies, hit store shelves in 1999.